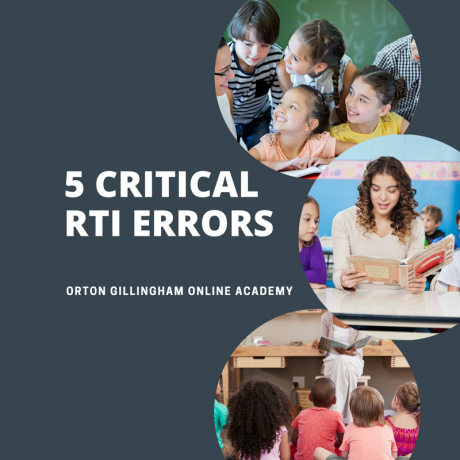 From my vantage point, there are 5 critical RTI errors schools make when implementing the RTI Model. RTI is a general education initiative that provides early intervention to prevent academic failure. This multileveled model provides a diagnostic & prescriptive approach that makes adjustments where necessary & drives instruction. When this model is delivered accurately, it not only minimizes the unnecessary referrals to special education, but it also enhances the students’ self-esteem. When they are able to monitor their own progress & see academic improvements, they begin to feel more at home in the learning environment. Inefficient Leadership – When the leadership is unfamiliar with RTI and what to do to make the model effective, the staff tend to muddle their way around without any clear direction. This renders RTI ineffective at best. Instructional Interventions Are Not Research-Based – I attended a conference at the University of Minnesota a few years back & Dr. Doug Fuchs (one of the grandfathers of RTI) was the keynote speaker. I sat across from him during our lunch & he told those of us gathered around: “Never forget to use research-based strategies (such as the Orton Gillingham Approach) during your interventions for tier 2 & 3.” The importance here is for Districts to train their teachers & to provide them with the resources necessary to be successful RTI interventionists. No Data Team in Place – From my experience, data teams contribute to the success of RTI as they drive decision making. When teachers are left to their own devices to assess data and make critical decisions throughout all of the tiers along with their other teaching responsibilities, they tend to buckle without the proper support. Progress Monitoring is Neglected – Progress monitoring is one of the essential elements of the RTI model. How is one to assess responsiveness to intervention without ample monitoring of progress during tier 2 & 3 interventions? It is important to continuously diagnose the situation (collecting progress monitoring data, making note of strengths & weaknesses…) & then prescribe what to do in subsequent lessons. It is vital to know when adjustments are necessary to the instruction, or if it is appropriate to continue along the same path. It is recommended to PM every 2 weeks for tier 2 & every week for tier 3. This step is truly best teaching practices. Intervention Group Size is Too Large – Ideally, tier 2 is a small group of 3-5 students and tier 3 is a 1:1 or 1:2 teacher student ratio. When these groups are too large, it is very difficult to target the specific needs and promote student progress. When I taught at a rural Indiana school a few years back, I was so impressed at how well they implemented the RTI Model. I attribute the success to amazing leadership. Not only did our leader attend numerous RTI training seminars, but she also insisted her staff jump on board, providing scaffolding along the way as needed. Our data team leader had a list of all the research-based strategies on school property & the deficit areas they target. All grade-level teachers & interventionists were keeping explicit progress monitoring data. Each grade level met with the data team on regular intervals to present their data & to make data-driven decisions. Intervention group sizes were aligned with the RTI recommendations. Very few students went through the special education referral process & most were fully remediated & reconvened successfully with their tier 1 peers. Many IEP students were dismissed from special education rosters as a result of successful interventions targeted to meet their specific needs. The Orton-Gillingham Approach – This approach is research-based and time-tested to be a remedial tool for those with language-based Disabilities (Dyslexia). The Orton Gillingham Online Academy offers a comprehensive online course based on Orton Gillingham principles. This course provides everything a teacher would need to deliver successful OG lessons to their students. It works beautifully in both tier 2 & 3. Read Naturally – This program is multileveled and involves repeated readings for fluency & comprehension. Take Aim – This is a wonderful program for those students reading on a 4th+ grade level & who needs the additional support with comprehension & vocabulary development. Visualizing & Verbalizing – This program is excellent for those who have difficulty visualizing what they are reading. They may be fluid readers who simply have difficulty playing out what they are reading, as if watching a motion picture. This program assists students with comprehension & thinking skills. The above list is certainly not exhaustive & is only the beginning of wonderful research-based programs designed to target deficit areas. Again, RTI is an amazingly successful model when implemented accurately. It is a winner for administration, teachers & students. We owe it to our students to provide open doors to their optimal learning & potential.